We are now down to 70 and all remaining players are now guaranteed at least $489. Play will continue tonight until approximately 1am or the final table, whichever comes first. There are now only 74 players remaining in the $300 Bounty event with to 70 finishing in the money. The blinds are currently 5,000-10,000 with a 1,000 ante and the average chip stack is just under 122,000. The players in the $300 Bounty event are now on their dinner break. With 102 players remaining, the average chip stack is now just over 88,000. Salvatore Mancuso Wins the $500 Deep Stack Event! The final four players agreed to a deal and Salvatore Mancuso is officially the winner of the $500 NLHE Deep Stack Event. He takes home the trophy and $16,538. James Capone was all in for his last 125,000 with [Ah][Qc] against the [6c][6h] of Charles Davis. The board ran out [Js][Td][2h][6d][Ac] and Capone was eliminated in 5th place for $5,377. The final three players in the $400 7-Stud High/Low event, Joel Rosenberg, Igor Tiguy and Michael Frejka, came to an agreement on a chop. The flop came down [Kd][Qd][Jc], giving both Mancuso and Bensekri a set along with a straight draw for Happas. The turn was the [4s] and the river came the [7c]. Mancuso won the whole pot with the set of kings. 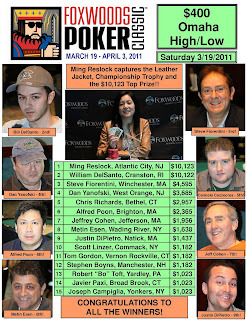 Happas was eliminated in 7th place for $3,712 while Benzekri officially took 6th place for $4,378. The blinds in the $300 NLHE Bounty event have been increased to 1,200-2,400 with a 300 ante. With 218 players remaining, the average chip stack is now just over 41,300. Chris Baksh got his last few chips in with [Ks][Jc] against the [As][7s] of Charles Davis. The board ran out [8s][6s][6h][7h][5c] and Baksh was eliminated in 8th place for $3,046. 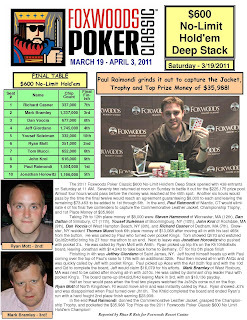 Charles Sanderson got all in before the flop with [Ad][Jh] but was up against Salvatore Mancuso's [Ac][Kc]. The board ran out [Qd][9h][3h][Kh][4s] and Sanderson was eliminated in 9th place for $2,572. The board ran out [Js][6c][5h][7s][5s] and Eriquezzo was eliminated in 10th place for $1,951. We are now down to the final table of the $500 NLHE Deep Stack Event. We had a total of 601 players in the $300 NLHE Bounty event. Day 2 of the $400 7-Stud High/Low Underway! Day 2 of the $400 7-Stud High/Low event is now underway. The blinds are currently 3,000-6,000 with a 500 ante for another 29 minutes. The players on Day 2 of the $500 NLHE Deep Stack event are now on a break. 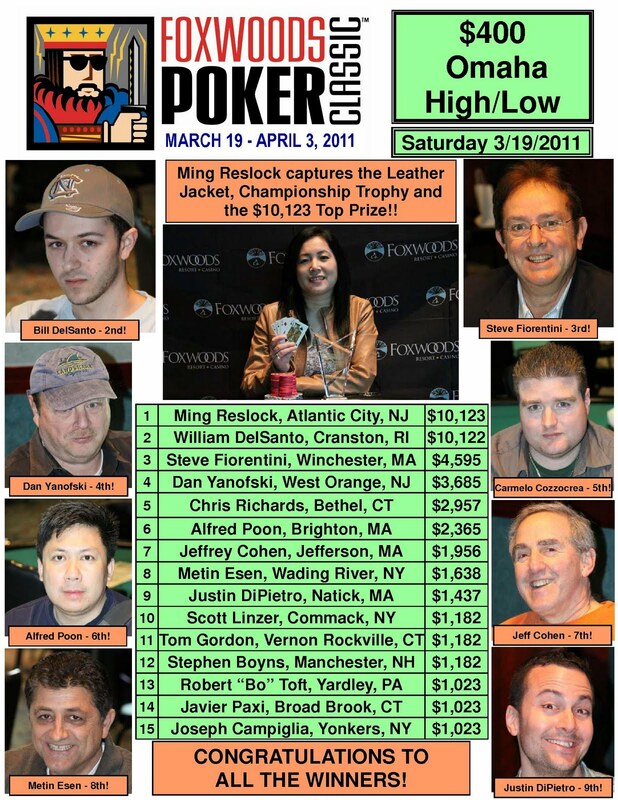 With 16 players remaining, the average chip stack is just under 279,000. The players in the $300 N0-Limit Hold 'em Bounty event are on their first break of the day. There are approximately 539 players remaining. We are down to the final two tables of the $500 Deep Stack event. With only 19 players remaining, the average chip stack is now just under 235,000. $500 NLHE Day 2 Now Streaming Live! Day 2 of the $500 NLHE Deep Stack event is now underway. The blinds are currently 4,000-8,000 with a 1,000 ante for another 30 minutes. 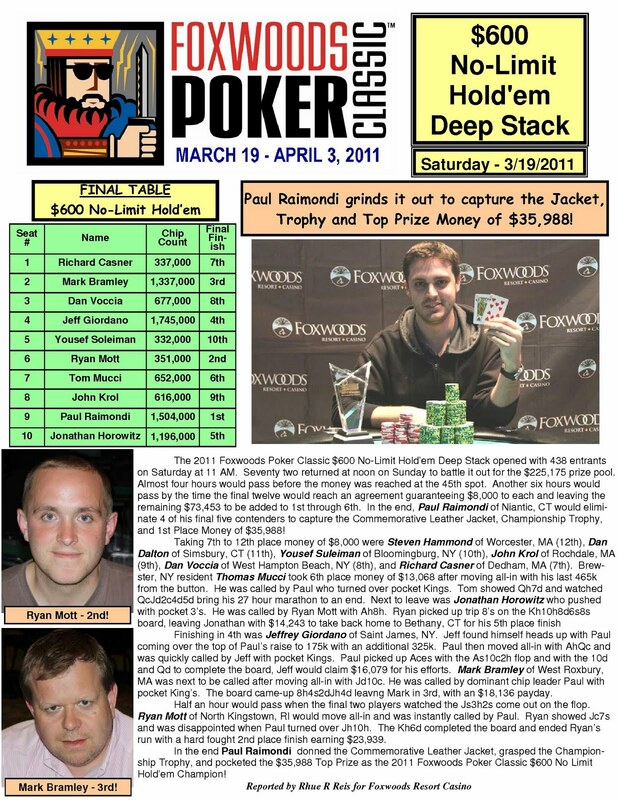 With 25 players remaining, the average chip stack is just over 176,000. Over 500 Players in the $300 Bounty Field! With registration remaining open for the first two levels, there are already well over 500 players registered for today's $300 Bounty event with a line of people still waiting to get registered. $300 NLHE Bounty Event is Underway! The $300 NLHE Bounty event is now underway. Players earn a $50 bounty on each person that they eliminate.